I think of the many mothers, wives and sisters who wait as anxiously, pray as fervently in their far away lonesome homes from their dear ones, as we do here; I fancy them waiting day after day for footsteps that will never come, growing more sad, lonely, and heartbroken as the days wear on. What woman has stretched out her hand to save them, to give them a cup of cold water? Where is the charity that should ignore nations and creeds, and administer help to the Indian or heathen indifferently? Gone! All gone in Union versus Secession. That is what the American war has brought us. Die poor men, without a woman’s hand to close your eyes! We women are too patriotic to help you! I look eagerly on, cry in my soul… Behold the woman who dares not risk private ties for God’s glory and her professed religion. Coward. Helpless woman that I am! 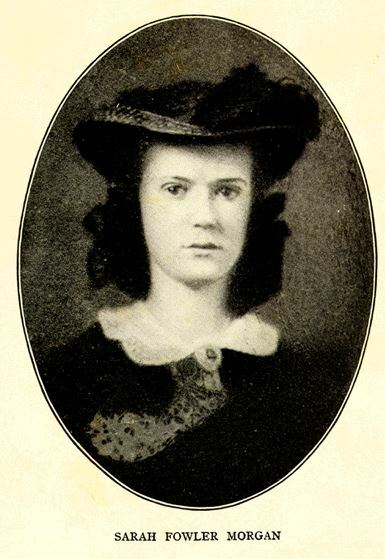 Twenty-year-old Sarah Morgan lived in Louisiana and supported the South. Earlier in 1862, she, her widowed mother, and family had refugeed away from their home in Baton Rogue. In a difficult situation with her oldest brother supporting the Union, Sarah started recording the happenings, events, and thoughts in a private journal. Her writing reveals the emotional side of the Civil War story. Throughout the war, she would continue to move between family members’ homes, refugeeing and trying to stay safe. These excerpts from Sarah’s journal in June 1862 reveal multiple conflicts. She struggles with the thought that the wounded and dying soldiers around her were enemies, but those enemies had mothers and sisters waiting at home. There she was: a sister to absent brothers, but unable (unwilling) to help. Clearly, Sarah wanted to help these soldiers, but she felt imprisoned by public opinion, noting that her loyalty was already questioned because she sent food to an ill enemy soldier. She berated herself, but was unwilling to risk society’s disapproval that day. The conflict got worse. Both society and practiced religion were at civil war in this situation. The society traditionally saw women as comforters and care givers, but the new war-prompted feelings of loyalty and patriotism went against that traditional role when it came to helping a dying man in a blue uniform. At one time, religion preached mercy and “love thy neighbor,” but during the war, many organized churches were preaching wrathful sermons against the invader. The entire situation must have felt like a hopeless trap. And Sarah called herself a coward for not following through with what she knew in her heart would be right. 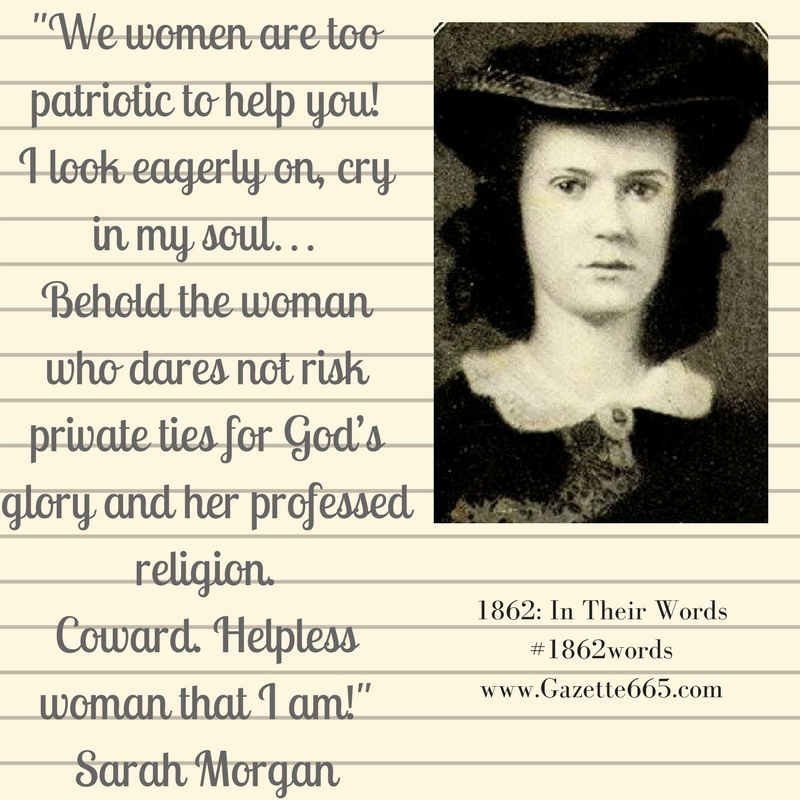 From the 21st Century perspective, it’s easy to sit back and cast blame on Sarah Morgan for not overcoming her fear of neighbors’ opinions and helping the sick and wounded enemy soldiers. And there’s certainly a problem – don’t think I’m downplaying that. There was a problem in a society of matrons who would stand by and let men suffer simply because they were enemy soldiers. However, to try to understand Sarah’s position, there are a couple things to consider. 1) She was single, and anything she did was going to reflect on her family. 2) Refugeeing and in a hostile situation (from the soldiers and the neighbors) Sarah needed to keep a “quiet profile” to protect her family. 3) Even if she had stepped forward with active aid, how long would’ve she have been able to continue before society started ruining her reputation? One thing to keep in mind when studying history, you have to understand the situations, but always be careful before judging another person if you haven’t walked a mile in their shoes. I’m not advocating white-washing history or covering up challenging situations. Just try to see it from the original perspective. This journal excerpt should help us see the extreme pressure and conflict civilians discovered. Where could they draw the line between safety, right, patriotism, religion, duty? Each of them made decisions. And that is part of the story. The history. P.S. What would you have done in Sarah Morgan’s situation as described in her journal entry?